Access the on-demand video for the event HERE. 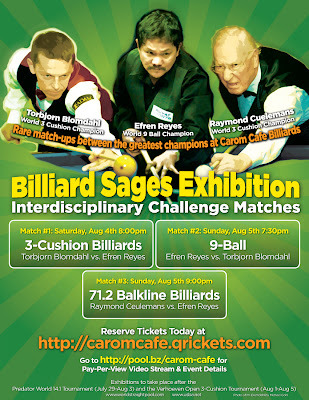 On Aug 4th-5th, 2012, Efren Reyes and Torbjorn Blomdahl locked horns in a dual-discipline 10-ball/3-cushion challenge. Each player attempted to secure an expected win in their respective specialty while upsetting the other in their own game. Years ago, Reyes and Blomdahl played a similar interdisciplinary exhibition (in Japan on YouTube) and Blomdahl won both the 3-cushion and the 9-ball portions of the contest. Efren Reyes sought his revenge in front his NY pool fans. 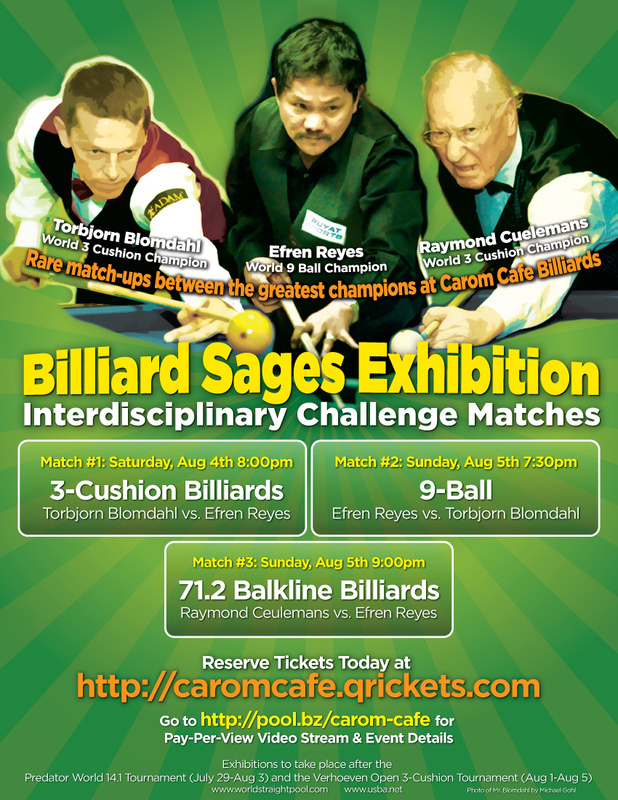 The grand finale concluding the week was a rare balkline exhibition match between the two great pillars of the pool and carom worlds: Efren Reyes and Raymond Ceulemans. Sir Raymond Ceulemans is the greatest carom billiard player of all time. Numerous fellow professional players have credited Reyes with being the greatest living pool player in the world. Many pool players will be surprised to learn that one of the finest pool player's (Efren Reyes), favorite game is not 9-ball, 8-ball or even 1-pocket; but balkline*. *In this IPT interview, Efren Reyes, attributes his skills at the table to his favorite game of balkline. Special thanks to Jim Shovak, Michael Shamos, Noel Mendoza, Amazin Billiards, Michael Bray, Bob Jewett, Victor Stein, Robert Byrne for bringing us this exhibition. HighRock, Inc.. Picture Window theme. Powered by Blogger.